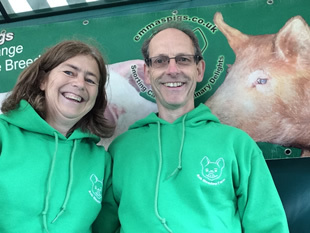 Emma's Pigs is a free range, rare breed, pig business, specialising in providing high quality pork based hot food at local events. We believe that visitors to shows, festivals, fairs and other events should be given the opportunity to purchase delicious, ethically produced, 'food to go' and should not be limited to the more usual burger vans. 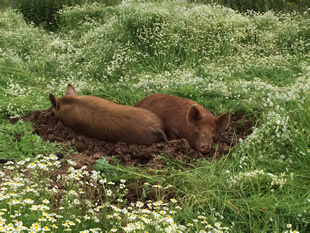 We keep our own Traditional British Pigs (mainly Berkshires and Tamworths), which we raise outside so that they are able to root, forage and wallow, whenever they want. We also provide them with arks where they can shelter from the midday sun or the winter winds. These arks are stuffed full with straw and are very cosy, though the pigs do not seem to mind the cold at all, having thick hairy coats which protect them from the worst of the weather. For lots of photos and videos of our pigs please follow the links. 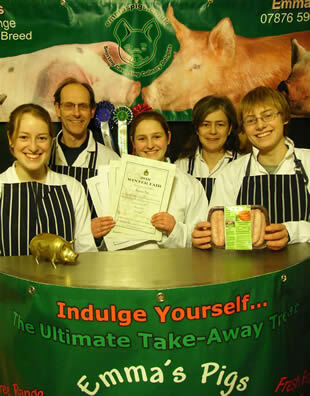 We have won a host of awards for our pork products, but if you're not interested in awards the proof is in the eating. We are always thrilled at the large number of regular visitors we have to our stand. People search us out and remember us from one year to the next. If you haven't tried our produce yet - you are missing out! See our pork page for more information on our mouth watering food. For anyone who has ever thought of building their own house we have recently moved into our Self Build. This really was a hands on project from inception to completion, starting with the purchase of an old JCB so that we could dig the foundations. We have not completely finished yet but are out of our caravan and in the warm again. Please be warned however, we may have built the house but we are a long way off finishing the website!